Piper Wilkin, left, signs up for the Southern State Community College Kids BBQ competition coming up at Smokin’ in the Hills this weekend at Rocky Fork Lake. 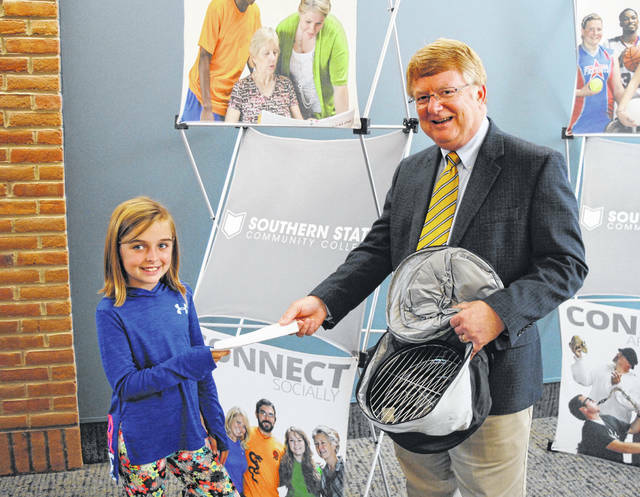 Dr. Kevin Boys, president of Southern State, right, is shown with a tabletop grill/cooler combo, which the first 25 participants will receive on entry. The competition, open to young people age 7 to 15, will be held Saturday, Sept. 22 at 3:30 p.m. Participants will cook sliders. While there is a $25 entry fee, the grill and cooler are included. The first place griller will receive $75 and second place winner will receive $50. Participants in the kids BBQ will need to bring their own “sliders” and buns, in addition to charcoal and a lighter. For more information on the contest, call 937-402-4347.